At the moment, you can start your farm and enjoy the initial quest line, all the way up to Learn and Grow VI: Gina's Vote, but after recieveing your introduction to the Tillers Union you will have to part ways. As it currently stands you will have to wait untill level 90 before you can continue your farming career. You can still plant, grow, and harvest on your four initial starting spots, but any more will require significantly more reputation than you can acquire at level 85. The Family Farm. It is here that your partnership is forged and you begin to grow crops on the farm under Yoon's tutelage. As if by magic all planted seeds instantly turn into sprouting crops, due to the special soil in the valley. As you'll soon see though, the crops are parched and need watering. Yoon will give you his Rusty Watering Can allowing you to turn your Parched Cabbages into Growing Cabbages. Now it's time to harvest your first vegetables. Doing so gives you the achievement Green Acres and returns the soil back to untilled soil, ready for you to start over with new seeds. Before you set off you're told to investgate the small patch of Dark Soil under the farm house, where you will find a Marsh Lily. Handily the perfect gift for Tina as you make your introduction. Gina tells you how she has been supplying the chefs in the area with their ingredients to cook all their meals, but now she's run out of Scallions. The perfect oppertunity to put your new farm to work. Walk over to Merchant Greenfield, and this time you'll see his whole inventory open for sale. A short browse and you should find the Scallion Seeds you're looking for. When you return to Sunsong Ranch you'll see you have four patches of untilled soil available, not just two. The basic crop seeds you can plant at friendly (Scallion Seeds etc), will most likely grow into 'Ripe Vegetables' and yield the results listed in the table below. However there is a moderate chance that when they grow over night, they will form 'Plump Vegetables' instead. When harvested plump vegetables will give 8 items instead of the usual 5. There is also a small chance when you harvest any plant on your farm, that it will give you a rare item for reputation, such as Lovely Apple, in addition to it's typical loot. Very occasionally, in place of the regular seeds that have a chance to drop, you can recieve Ominous Seed, which when planted will grow into Terrible Turnip. I can not seem to find any information on when exactly Mung-Mung's Vote I: A Hozen's Problem unlocks anywhere online. Google has let me down for once. I've had people tell me it unlocks at honored yet my reputation with The Tillers is honored (5491/12000) and I'm bff's with all the NPC's available. Still, no new quests are available for me. Just the dailies everyday. I feel like I'm missing something I should have done. This guide is the closest I've found to an answer and it is very informative on many things, but it still just says "Once you get a little more reputation with the Tillers." How much more rep exactly? Ella: Adds a cat named "Luna" to Sunsong Ranch. Mails a Tree Seed Pack containing 3 Blossom Tree seeds (Autumn Blossom Tree, Spring Blossom Tree and Winter Blossom Tree). Farmer Fung: Adds a prized level 90 Yak, "Shaggy", to Sunsong Ranch. Mails an Enigma Seed. Haohan Mudclaw: Adds "Miss Fifi", a level 86 Mushan to Sunsong Ranch. Mails 3 Songbell Seeds. You will get the <Farmer> title once you hit Exalted with The Tillers. 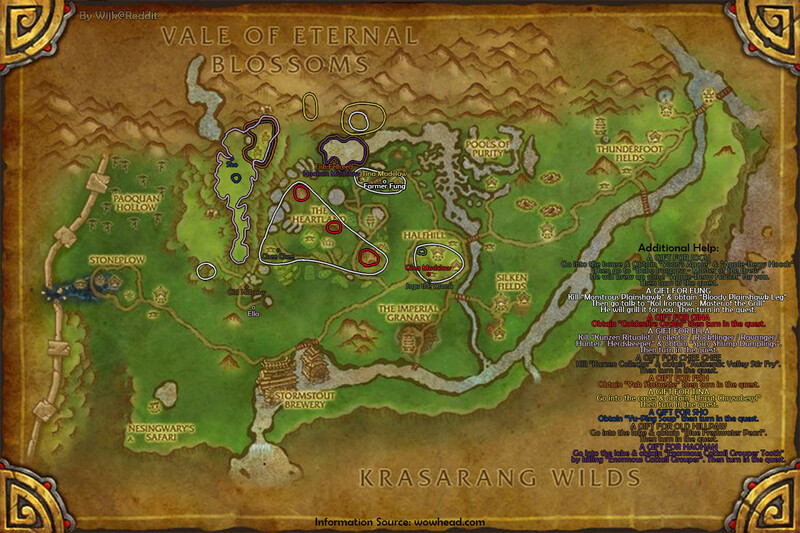 As of patch 5.2 you can now take over the ownership of the farm from Farmer Yoon by talking to Tina Mudclaw. Just a note for people like me who didn't realize this, once you gain revered status, you can buy "Grand Commendation of the Tillers". I did not realize this works for ALL characters, not just alts. It will help speed up the revered to exalted status greatly if you use it :) Happy Rep Grinding! After finishing up with the votes, you should then be able to get the quest Growing the Farm III: The Mossy Boulder from Farmer Yoon once you reach exalted. After reading a post on Bursting Crop proc chance I decided to attempt this to get Haohan's Vote IV: Melons For Felons done in a single day. Friendship: NPCs have their own "friendship" bars--becoming their "Best Friend" allows you to unlock additional rewards for your farm.